Bitcoin SV (Satoshi’s Vision) emerged out of the Bitcoin Cash hard fork that happened on November 16. We assess this coin as Non-Investment Grade with a stable outlook mainly due to various uncertainties such as the ongoing hash war or the lack of real-world use cases. NEM (New Economic Movement) due to a “stable” (compared to the overall negative market movements) development in terms of market capitalisation. For this cryptocurrency we evaluate the case as Non-Investment Grade with a stable outlook since the international audience is limited and the community is rather small compared to its major competitor Ethereum. EOS outlook changes from positive to negative due to a report issued by the blockchain security company PeckShield and reported by Blockchain Truth that states serious security issues with 27 dApps and solely 37% active accounts. Bitcoin Cash (side note: we have observed that a majority of exchanges are using the Bitcoin Cash (BCH) to refer to the Bitcoin Cash ABC implementation) outlook changes from positive to negative due to various uncertainties such as the ongoing hash war or the lack of real-world use cases. We hope you enjoy our independent and professional assessment and stay tuned for our next edition in January 2019! We wish you a Merry Christmas and a happy new year. Cheers! 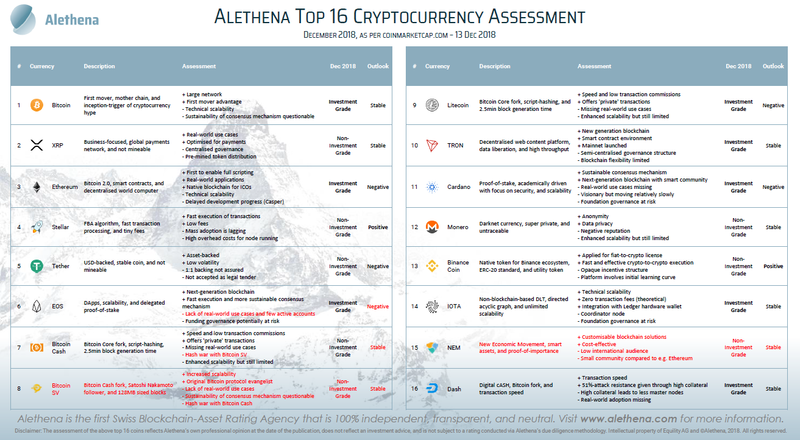 Disclaimer: The assessment of the above top 16 coins reflects Alethena’s own professional opinion at the date of the publication, does not reflect an investment advice, and is not subject to a rating conducted via Alethena’s due diligence methodology. Intellectual property of Equility AG and ©Alethena, 2018. All rights reserved. Alethena is the first Blockchain-Asset Rating Agency made in Switzerland that is 100% independent, transparent, and neutral. Visit www.alethena.com for more information. 29-year-old blockchain enthusiast, entrepreneur at heart, and avid reader. Co-Founder & Chief Product Architect @ alethena.com. Alethena is a Swiss fintech company specialising in blockchain applications and digitalisation.